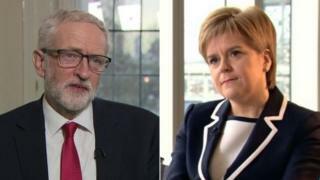 Nicola Sturgeon has said it would be "strange" for Jeremy Corbyn to oppose a Scottish independence referendum while backing self-determination elsewhere. The first minister met the Labour leader at Westminster on Wednesday for talks about Brexit. He has previously said he would "decide at the time" on whether to allow a new vote on independence if he becomes PM. Ms Sturgeon said she was sure Mr Corbyn would have backed giving Scotland "the right to choose" before he was leader. She told the BBC that she had not had a "specific conversation" with Mr Corbyn about whether he would grant Holyrood the power to legislate for a referendum, but that "there may well be a point" where that happens. Ms Sturgeon said in January that she would give an update on her timetable for holding a new Scottish independence referendum within "weeks", but has repeatedly said she needs to wait for more clarity about Brexit before doing so. Prime Minister Theresa May has previously insisted that "now is not the time" for a fresh vote on independence. And Foreign Secretary Jeremy Hunt said in March that the UK government would "of course" refuse to give its backing to a new vote via a "section 30 order", the transfer of powers to Holyrood which underpinned the 2014 referendum. Listen to more from the Nicola Sturgeon interview and analysis on the latest Podlitical podcast. Ms Sturgeon told the BBC that she did not know if the current UK government "will even exist by the end of the week", saying it would be "for all of us in Scotland" to "make the case so powerfully that no Tory prime minister can stand in its way". She also said that Mr Corbyn - who has repeatedly called for a general election which could make him prime minister - "knows my views on independence". Asked whether she had discussed the idea of granting permission for a referendum with him, she said: "We haven't had that specific conversation - I dare say there may well be a point where we may well have that conversation. "The interesting thing about Jeremy Corbyn is, before he became leader of the Labour Party, I'm sure he would have been absolutely fullsquare behind the right of the people of Scotland to choose their own future. "He seems to - and I'm not criticising him for this, I think it's broadly the right position - to support self-determination for countries all over the globe. It would be more than passing strange if he didn't do that for Scotland." Mr Corbyn did not rule out the idea of allowing a new referendum when speaking to BBC Scotland in September 2018, saying he would "decide at the time". However, he added: "We don't want another referendum, we don't think another referendum is a good idea, and we'll be very clear on why we don't think it's a good idea." During his speech to the Scottish Labour Party conference in Dundee in March, he said the party was "not obsessed by constitutional issues, like the others are". He said: "The real divide in society is not between people who voted yes or no for independence. It's not between people who voted to remain or to leave the EU. "The real divide is between the many, who do the work, create the wealth and pay their taxes, and the few, who set the rules, reap the rewards and dodge their taxes."